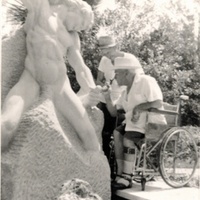 Sculptor Albin Polasek chisteling Man Carving His Own Destiny from limestone, with his assistant, Robert A. Baille, around 1960. Polasek sculpted his first version of Man Carving His Own Destiny while studying under Charles Grafly at the Pennsylvania Academy of Fine Arts in Philadelphia, Pennsylvania, in 1907. Reminisicent of Michaelangelo's Slaves, the sculpture depicts a man chiseling himself out of stone. Polasek has sculpted 53 different variations of Man Carving His Own Destiny throughout his lifetime. His various recreations depict differences in arm positions, the look of the hair, and how much of the man's body is emerged from the rock. Original black and white photograph: Albin Polasek Museum & Sculpture Gardens, Winter Park, Florida. Copyright to this resource is held by the Albin Polasek Museum & Sculpture Gardens and is provided here by RICHES of Central Florida for educational purposes only. 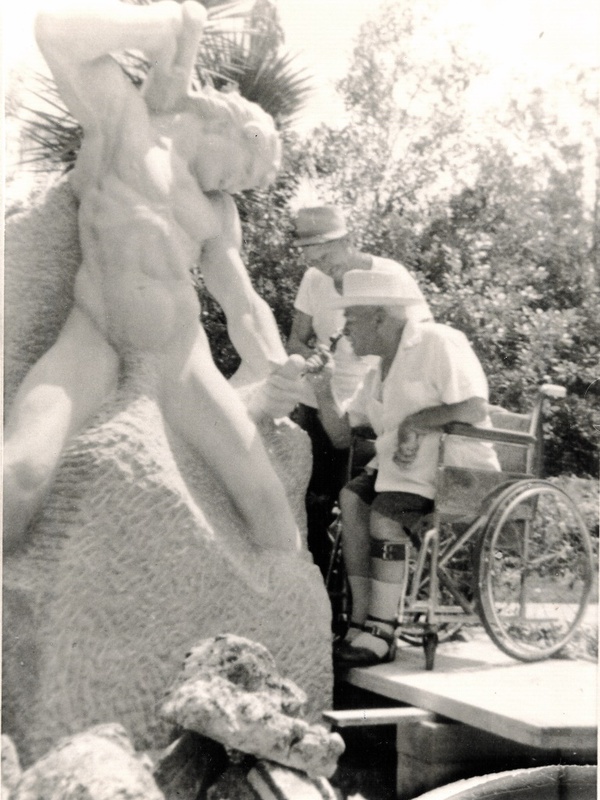 “Albin Polasek Chiseling Man Carving His Own Destiny.” RICHES of Central Florida accessed April 19, 2019, https://richesmi.cah.ucf.edu/omeka/items/show/5388.